How can you engage students in their own independent learning? One of the fastest ways to engage students in independen, self-directed learning is to provide them with word search puzzles. These Valentine's Day word search puzzles are more of a challenge because the letters for each of the words in the list have been scrambled. To solve the puzzle students need to unjumble the words and then locate the words in the grid. 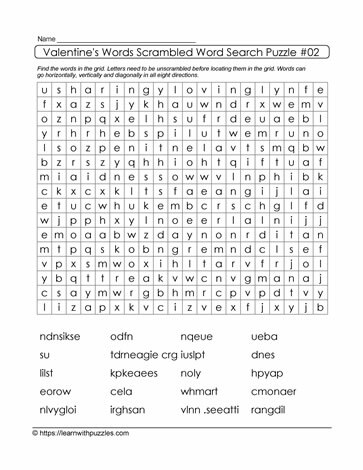 Word search puzzle supports homeschooling curriculum, and grades 3 to grade 6 classrooms.